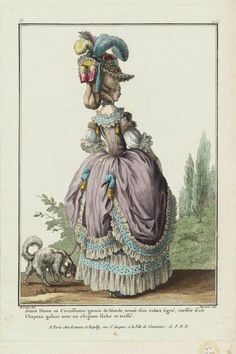 The Robe à la Polonaise became especially popular around 1770. However, this was not the first time the style was observed by the fashionable society. As early as the 1720's the style had been observed in English portraits although these were meant to be a more romantic version of the gowns worn by the ladies of Louis XIV's court rather than a new style. The bodice is fitted and closed (in comparison to the Robe à la Francaise) which helps to emphasise the small waistline. The style is characteristic by how the skirt is draped at the back: the skirt itself is draped up in three different sections in order to reveal the petticoat - in this way the petticoat becomes an important part of the gown. The skirt ended just above the ankle and the sleeves are elbow-long. To achieve the characteristic draping of the back, there were different methods depending on the fabric. For example a cord with little rings on it could be sewn in to the skirt (from the waist to the hem) and in this way make it possible to create the puffs. Sometimes a cord had been placed right below the waist with ribbons to tie the skirt up with. Light fabrics were preferred to these dresses - a sign of the simplification of style at the time. 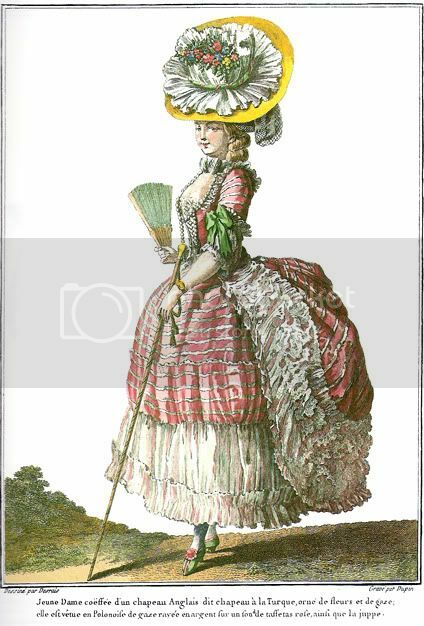 This style also meant that a woman could quit the panniers which were very welcome to many women. It was considered a "haute couture" version of the dresses worn by women in the countryside who would roll up their skirt in order to avoid getting muck on their skirt. This is why this style is sometimes referred to as the "milk-maid dress". For the ladies at court it was practical although in another manner. It quickly became a popular gown for promenading in since the gown was cut just at ankle length which meant that the gown would not become dirty from a stroll in the garden. Compared to the robes à la Francaise and à l'Anglaise, it was an obvious advantage. By 1780 the dress had become so popular in Scandinavia that the King of Sweden chose this particular design for the national dress. The silhouette of the Polonaise gown was lighter than the other common court gowns. 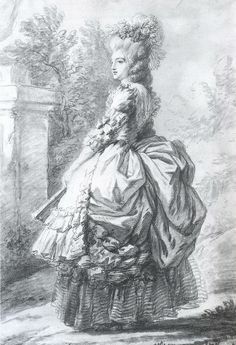 It was the first step towards an all-together lighter silhouette in women's fashion; the chemise de la Reine was a further extension of the process. Tres belle presentation intéressante. Merci!